The North Atlantic between Newfoundland and Ireland is practically the only region of the world that has defied global warming and even cooled. 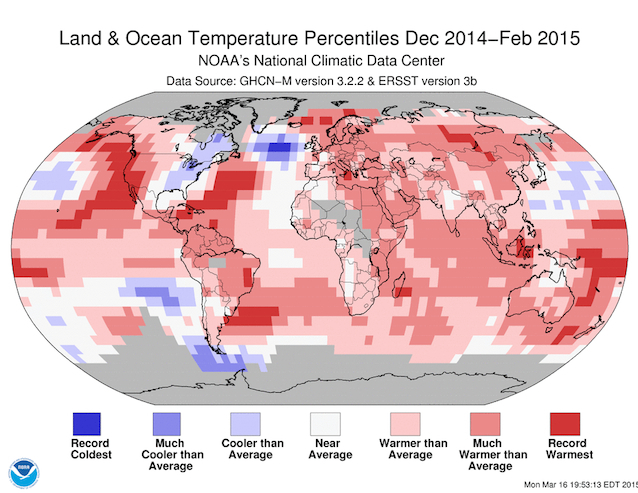 Last winter there even was the coldest on record – while globally it was the hottest on record. Our recent study (Rahmstorf et al. 2015) attributes this to a weakening of the Gulf Stream System, which is apparently unique in the last thousand years. The whole world is warming. The whole world? No! 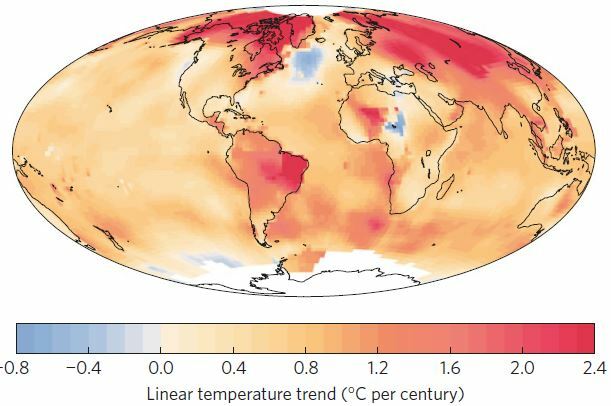 A region in the subpolar Atlantic has cooled over the past century – unique in the world for an area with reasonable data coverage (Fig. 1). So what’s so special about this region between Newfoundland and Ireland? Fig. 1 Linear temperature trend from 1900 to 2013. The cooling in the subpolar North Atlantic is remarkable and well documented by numerous measurements – unlike the cold spot in central Africa, which on closer inspection apparently is an artifact of incomplete and inhomogeneous weather station data. It happens to be just that area for which climate models predict a cooling when the Gulf Stream System weakens (experts speak of the Atlantic meridional overturning circulation or AMOC, as part of the global thermohaline circulation). That this might happen as a result of global warming is discussed in the scientific community since the 1980s – since Wally Broecker’s classical Nature article “Unpleasant surprises in the greenhouse?” Meanwhile evidence is mounting that the long-feared circulation decline is already well underway. The Atlantic circulation (AMOC) as part of the global overturning circulation of the oceans in an animation from NASA. Climate models have long predicted such a slowdown – both the current 5th and the previous 4th IPCC report call a slowdown in this century “very likely”, which means at least 90% probability. When emissions continue unabated (RCP8.5 scenario), the IPCC expects 12% to 54% decline by 2100 (see also the current probabilistic projections of Schleussner et al. 2014). But the actual past evolution of the flow is difficult to reconstruct owing to the scarcity of direct measurements. Therefore, in our study we use data on sea surface temperatures in order to infer the strength of the flow: we use the temperature difference between the region most strongly influenced by the AMOC and the rest of the northern hemisphere. Now we are not the first to have inferred from temperature data that the flow must have weakened. Evidence for this was already presented by Dima and Lohmann 2010 or Drijfhout et al. 2012, among others (for further references see the introduction of our paper). What is new is that we have used proxy reconstructions of large-scale surface temperature (Mann et al, 2009) previously published by one of us (study co-author and RealClimate co-founder Mike Mann) that extend back to 900 AD (see “What we can learn from studying the last millennium (or so)”) to estimate the circulation (AMOC) intensity over the entire last 1100 years (Fig. 3). This shows that despite the substantial uncertainties in the proxy reconstruction, the weakness of the flow after 1975 is unique in more than a thousand years, with at least 99 per cent probability. This strongly suggests that the weak overturning is not due to natural variability but rather a result of global warming. Fig. 3 Time series of the temperature difference between the subpolar North Atlantic and the entire northern hemisphere, which can be interpreted as an indicator of the strength of the Atlantic circulation. Also in 2014 we again find a remarkable cold bubble over the northern Atlantic – as a look at the NASA website shows. 2014 was globally the warmest year on record, 1 °C warmer than the average for 1880-1920. But the subpolar Atlantic was 1-2 °C colder than that baseline. And even more recently, NOAA last week released the stunning temperature analysis for the past winter shown in Fig. 4. That winter was globally the warmest since records began in 1880. But in the subpolar North Atlantic, it was the coldest on record! That suggests the decline of the circulation has progressed even further now than we documented in the paper. Fig. 4 Temperature anomaly map for the past december-january-february, from NOAA. Another new aspect is the importance of the increasing mass loss of the Greenland ice sheet, which causes extra freshwater to enter the North Atlantic that dilutes the sea water. We have joined forces with the Greenland expert Jason Box who has reconstructed the mass balance of the Greenland ice sheet since 1840 (Fig. 6 of our paper, see also his blog). 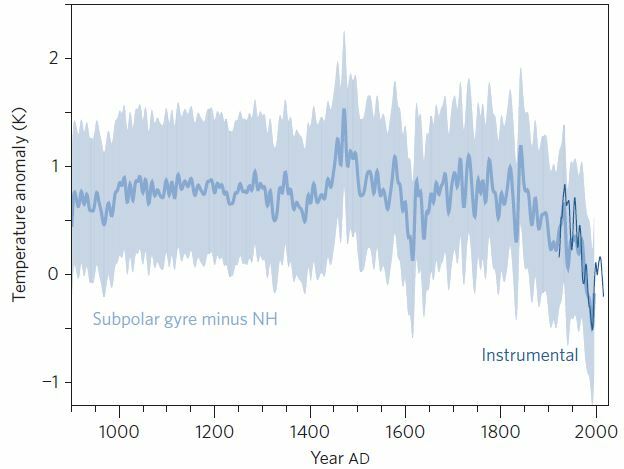 The ice loss amounts to a freshwater volume which should have made an important contribution to the observed decrease in salinity in the northern Atlantic – probably including the “great salinity anomaly” of the 1970s, famous amongst oceanographers. 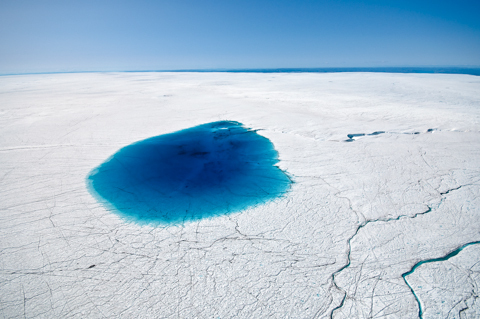 Meltwater on the Greenland ice sheet. Photo: Ian Joughin. What are the impacts of a slowdown? The consequences of a large reduction in ocean overturning would look nothing like the Hollywood film The Day After Tomorrow. But they would not be harmless either – e.g. for sea level (Levermann et al. 2005) particularly along the US east coast (Yin et al. 2009), marine ecosystems, fisheries and possibly even storminess in Europe (Woollings et al. 2012). We have studied these consequences some years ago in an interdisciplinary project with colleagues from Bremerhaven, Hamburg and Norway – the results are summarized in Kuhlbrodt et al. 2009. If our analysis is correct, then this indicates that climate models underestimate the weakening of the Atlantic circulation in response to global warming – probably because the flow in these models is too stable (see Hofmann and Rahmstorf 2009). Although these models predict a significant weakening for the future, they do not suggest this as early as the observations show it (see Fig. 2 of our paper). That the real flow may be more unstable than previously thought would be bad news for the future. If the circulation weakens too much it can even completely break down – the AMOC has a well-known “tipping point” (Lenton et al., 2008). The latest IPCC report (just like the previous one) estimates a probability of up to 10% that this could happen as early as this century. However, this assessment is based on models that may underestimate the risk, as mentioned above. Expert surveys indicate that many researchers assess the risk higher than the (generally conservative) IPCC, as is the case for sea level. In a detailed survey (Kriegler et al 2009), the 16 experts interviewed saw already at moderate global warming (2-4 °C) a probability of a ‘tipping’ (major reorganisation) of the flow between 5 and 40 percent. With strong global warming (4-8 °C) this probability was even estimated as between 20 and 65 percent. Fig. 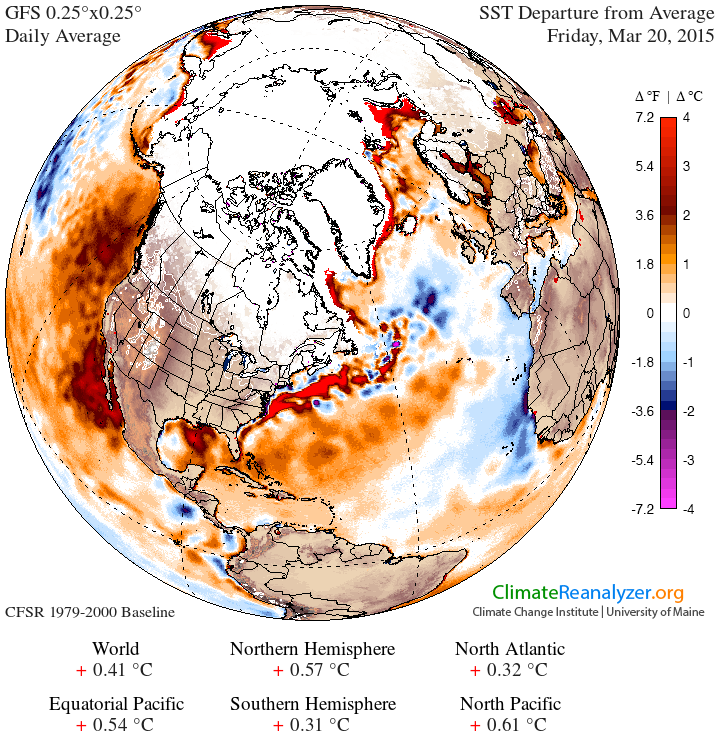 5 Sea surface temperature anomaly on 20 March 2015. Note that this is relative to a baseline 1979-2000, which is already a cold period in the subpolar Atlantic. Source: Climate Reanalyzer. Stefan – Do you have any estimate of the cooling effects of the pronounced flow of northwesterly cold winds around the southern tip of Greenland thence across the North Atlantic as happened this past Winter? If this flow pattern were stronger than usual, I would think the impact would be both a general surface cooling and increased upwelling of colder waters from below. I take it your graphs in Figure 1 & 4 present SST data, not water temperatures below the surface. Also, has there been any change in the THC within the Arctic Mediterranean as compared to the overall AMOC, as measured by the RAPID program? Can you relate this to the work mentioned here back in 2005? umm, that would be about the location most climate models calculated and still do calculate to be way cooler than the rest of the globe as the ghg-effect increases from the preindustrial levels. I don’t remember details though, didn’t some projections in 2000 look like that for 2020-2040s? Figure 4 reminds me of the many papers connecting AMOC to PDO, seeing the cold pool in NW Pacific in 2014 too. Any insights from your study on potential PDO interconnection? How would this change in currents affect the amount of heat in the surface layer that is transported into the Arctic and contributes to melting the Arctic Sea Ice? Would this reduce the heat transported or have little affect? Thanks for the informative post. What are the predictions for the behavior of the deep current component (i.e., southward-flowing Deep Western Boundary Current) of AMOC in this regime? I’m sorry if this is a silly question, will this area of cooling cause the ice to increase in this area? If the current stops will it start again if enough fresh water is re-frozen? Thanks for this treatment of this important paper. I have to raise an objection to the phrase “the only region of the world that has defied global warming” – that might be neglecting a certain area in the Pacific where England 2014 has identified a very obvious point where the “Pacific conveyor” was bringing in the last decade up a lot of cold water from the deep ocean and has possibly played a major role in the specific trends for that period. The region is also quite clear in Fig. 4. Can anything be inferred about what changes to the AMOC intensity do to the melt-rate of the Greenland Ice sheet? If the cooling effect were general and regional, I would expect that the melt-rate would decrease with decreasing AMOC. This would be a negative feedback, since the icesheet meltwater is supposedly a major driver of the slowdown. Conversly, if if increased the meltrate, it would be a positive feedback. But if I look at that chart of temperature trends, it looks like the mode which creates the coolspot, may be localized south of Greenland (or nonlocal portions of the modeshape, may be positive or nearzero over the icesheet). the bottom line seems to be that we are all totally and utterly, well, you know. 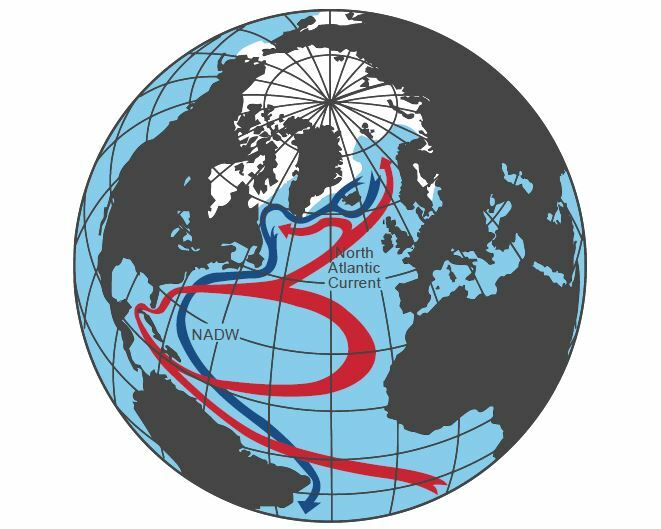 Conceptually, it’s hard to see how the Gulf Stream western boundary current could be weakened by conditions around Greenland; this is a fluid dynamics system, not a mechanical ‘belt’; a backup due to less deep water formation should have little effect on the physics of the gyre and the formation of the western boundary current, and it also seems the tropical warming and the resulting equator-to-pole heat transport are the drivers – but perhaps modulation by jet stream meandering is playing some role in the cooling? Paleoclimate studies of tropical ice cores tend to support the scenario of changes in the tropics propagating northwards, too, not the reverse. Hence the entire North-Atlantic-Driven-Global-Climate-Change theory might be in need of revision; conditions in the North Atlantic may instead be responding actively to changes in the tropics, not the other way around. This is a touchy topic for advocates of Broecker’s theories, but the paleoclimate data collected in the tropics just don’t support that scenario. There don’t seem to be any ‘master switches’ in the North Atlantic region that can toggle global climate into one state or another. It is 2015 now – 35 years later. What are you and the rest of the Climate Science community going to do about it now Stefan? More “research”? More “reanalysis”? Another “Paper”? Another “article” for Real Climate? An “AR6 IPPC Report” in a few years time? Apologies for not posting a data or research-related question. I’m a bass player. Does this paper scare anyone else like it kinda scares me? Again, I’m not a scientist, and maybe not used to clinical detachment, but everyone seems so calm. Except for Box. That dude looks like he has a lot of bad news to deliver. Is it not a big deal? Is it just that we have no reference for this type of event/trend? Also, I get the whole “Day After Tomorrow” plot reference/attention grab thing, but it trivializes the severity of the issue IMo. Seems like maybe “The Road” would be more appropriate. That movies’ plot connection was- 1. Humans break the the Oceans (acidification- check, irradiation from subs, reactor flush accidents, Fukishima,-check, toxification- heavy metals from industry, oil spills, toxic waste dumped at sea, plastic gyres-check) 2. Really bad things happen. Does anyone know how to put the toothpaste back in the tube once you’ve squeezed too much out??? I’m having trouble understanding how anyone expects to fix this problem. Any ideas? Thanks. Wili, we know we’re f*ed. The devil is in the details — to know those, we need good science for choosing to work toward the _right_ changes. Time and energy and attention and resources are limited. Some of the plans being pushed are scams, excuses to make money fast. Some are well meaning fantasies. Figuring out what’s what takes attention. Don’t echo confusion and fear. #17 Alec. You are quite right, it is astounding. And I invite you to respect your fear and maybe try to dismiss or move past it. Many people hold it in awe and deep admiration for the wondrous complexity of the science. The ramifications are beyond all comprehension. Nothing in all history of civilization is this momentous. And yes, the data and news and reports now come faster than ever. It is hard to process. It’s just that many here have been studying related topics, via this site for years, many years. This is the only place on the Internet I know of where great and respected scientists and lay amateurs can continually converge in a civil manner seeking information. The very design of this site enables this conference-like exchange. It was built and evolved for both exchange and as a great reference. Sometimes in a crisis it is comforting to do science, to explain and dissect and understand. It’s like in medicine when we get a diagnosis of a cancer – one way of dealing with the shock is to dive into the medical science. As did the late Dr Stephen Schneider – look for his videos for a balanced attitude. Everyone I meet is stunned about it, but each person processes it at different levels. Work helps. Learning how to best communicate is vital. It seems like everyone respects anticipatory grief. Many know it is there, and just prefer to keep working on the science. It is huge. It deserves our full attention. It is a huge topic to examine how humans might best process news and science that seems so ruthlessly harsh. And Alec, there’s a great need for a bass player – more music. The movement and the science needs new anthems, operas and marches to inspire and get us moving. I found a couple of YouTube playlists that total about 100 pieces of music… some are very old and classic. Some rock, some humor, plenty of variety, but more music needed. In the paper, you mention that …and indeed the time history of Greenland meltwater runoff is not included as a forcing in the CMIP5 ensemble (2nd para before end). Is it the precise time history that is the point, that is, that with natural variability and all, models might not be expected to capture the timing of the 1970–1990 cooling? Or is the freshwater flux to the ocean from the melting ice sheet for some reason not represented in the models as a forcing on the circulation? (That’s how I first read it, but it doesn’t rhyme). I live on the NH seacoast and have directly observed an ocean that has had a significant decrease in wave height, on average wave height has only been 1-3 ft. On most days it is very difficult to differentiate between the tide coming in or going out. The water rises and lowers but there is very little wave action on the approach of the high tide. Hi there! I knew it! Takes a basist to now one. Haven’t seen ‘The Road’ so can’t comment on that, but one single spot of cool on the ocean surface won’t stop the warming on the continents for most of the year so ‘The Day After Tomorrow’ is out. Maybe this keeps the winters a bit cooler, that’s to say normal or only slightly warmer than previously, in east coast of North America and European shores of Atlantic. Jason Box has really some nasty things to say that I, however I would like, can’t refuse, true. Ocean is not too large that humans could not influence it. Does fish taste different today than twenty years ago? I can’t say either but maybe 20 years from now? Wasn’t this scenario described by James Hansen in his book, Storms of My Grandchildren? What are the long-term (and how long-term?) consequences of a failure of the Atlantic meridional overturning circulation for i) global oceanic circulation and ii) ocean anoxia in a warming world? There is evidence, reported by Peter Ward, of purple sulphur bacteria (detected via the existence of long-lived fingerprint molecules) that require oxygen free, H2S abundant conditions, with sunlight, in (therefore) shallow seas at the end Permian mass extinction and other such events. If the Amoc slowdown is the first step towards ocean anoxia, it would appear also to be the first step towards utter catastrophe. Stefan @22, thanks. I had somehow got the idea that ice sheets were included now, but I should have checked (the AR5 is explicit they’re not coupled in CMIP5). My bad. -This cold spot is likely to come from the Arctic glacial melting. This is not include in climate model. Therefore, we don’t know what will be the global consequence. -It is my understanding that such cold spot could be the source of the permanent high that bring the Jet Stream south and kept the East of North America cold for the last two years. Accordingly, this might be a semi-permanent climatic feature. -This semi-permanent state might end up when the AMOC will stear its trajectory or slow down to the point that it no longer bring heat into the Artic ocean which may refreazed, get colder and stop the Greenland melt. I plan to do a blog post on this. So any additional information would be interesting. Jun 28, 2013 – What does climate change sound like? … approach called data sonification to convert global temperature records into a series of musical notes….using music to communicate the latest in climate science. … converts global temperature records into a series of musical notes… with the coldest year on record (–0.47 °C in 1909) set to the lowest note …. Any comment on this paper showing there is no slowdown? And why is this paper not referenced? Mary Paino, you may set your fears at rest. The record shows quite the opposite. For more detailed information, you might go to Neven’s (or for a matter of that, any of the more official bodies such as the NSIDC that regularly update their information based on the latest observations. Politics will not change reality; the ever evolving methodology of science, which attempts to look at and understand reality, is our best bet for knowing the big global picture. And the science involved with the effects of accumulating heat-trapping greenhouse gases increasing the energy in our earthly circulatory system goes back to Arrhenius and Tyndall and has only become clearer over time. Of course there are local variations in sea level height, as you personally attest, for a variety of reasons. However, you bring forward a deeper problem, which is the prevalence of short-term and local observation supported by what is sometimes called “blog science” and the media’s acceptance of false balance that provides you with a massive amount of unreliable information (some of it very professionally presented using the best PR money can buy from the wealthiest industries on earth, with an infrastructure that mimics the real thing) and encourages you to reject what is an overwhelming agreement amongst the world’s best expertise about what is going on. Does this have any link to colder winters in eastern North America? (I’m hoping the answer is ‘no’). Set in an America of the almost-now, Fifty Degrees Below (and the first volume of the trilogy, Forty Signs of Rain) tells the story of the efforts of a loosely-connected group of scientists, campaigners and politicians to provoke a national response to the crisis of global warming. Unfortunately for them, as environmental aide Charlie Quibbler observes, it’s “easier to destroy the world than to change capitalism even one little bit”. It is not until the combination of two colliding storm systems and an unprecedented tidal surge causes Washington’s Potomac river to bursts its banks and overwhelm the country’s capital at the climax of book one that the world sits up and takes notice. But, by this point, the polar ice caps have already begun to melt in earnest, shutting down the warm waters of the Gulf Stream …. I’d welcome a topic on what the climate scientists have been reading. I recall long ago how Ray Bradbury was given a tour of a NASA facility and was taken completely by surprise when everyone there knew who he was. They’d grown up on his stories about space travel …. What are you young climate scientists and your kids growing up reading? We are all leaders, (family, friends, community, etc. ), followers, (the thousands of enlighten luminaries throughout history), and boots on the ground, (do what you can every day to make the world a better place). Stefan, I do not have a suggestion for the moment, only had the question. I thought it was a good question to ask the experts. Thanks for the answer. Chuck Huges, #18: … “does anyone know how to fix this problem.” IMO: The first step is to start with the little things in our lives, drive less and keep the fuel prices below $60/bl. efficiency first in your life. Endorse Green Politicians. Buy green products, vote with your dollars. Help end tax funded pollution of the commons. Din’t feed the Capitalistic Pig with your $$$. Not any job, only green jobs help fill the hole pollution has bequeathed humanity. There is work for all the world over in the Green Awakening Economy. By definition the GAE will look different and IMO financed by distributed green energy providing $$$ from the sun in the pockets of all, Not fossil fuel tax funded pollution profits to the pockets of the 1% tax shelters. To that end I suggest that each kWh of energy have a base value of all social services, from street sweeper to universal health care and war. Weather produced in your back yard, community green or the deserts of Africa or the roofs of shanty town. Green energy must become a public trust, not just another way to make a new 1% class. It is important to remember the fossil industry started with one well ~150+years ago. Yvan Dutil, it’s an interesting idea but on the whole I think it exaggerates the effect and almost looks like wishful thinking. However, as a weatherwatcher (over time and worldwide) with climate interests and a primary residence in Boston (US), I don’t think your idea about a refreeze will hold water (pun intended). I’m just guessing, but I think the cold bit will be overcome by a hot summer in the US northeast even this year. Wild speculation, I know. In any case, our snowfields have already melted significantly and it is still March. Meanwhile, it has been quite warm in England, which should also be affected. The business of cold interchange between my part of the world (and selected others) and the Arctic is interesting, but summer still tips the scales the other way. The question might be, in what might be thought of as a race between Arctic melt and AMOC disruption, will the local northern cooling offset (and how much) the Arctic Circle (Greenland) melt. My guess is not much. But “I am not a scientist” (apologies: not funny these days). I see you are an astrophysicist, and I am also reminded of my father’s (PW) warning about assuming expertise outside one’s specialty. Though I am much further afield than you. Perhaps I should have left the answer to someone more skilled and knowledgeable; my excuse is that I am interested in the idea and open to correction. I thought we only ran the risk of a Thermohaline System when carbon dioxide levels reached over 1000 parts per million. To my understanding we just crossed Into the 400 area even then I thought it be a an events on apocalyptic levels because of the oxygen not reaching the bottom of the ocean and only the very surface would be habitable. Stefan – There’s no reply to my questions (#1), so allow me to amplify a bit. The term “Arctic Mediterranean” has been applied to the deep waters poleward of the Greenland-Iceland-Scotland (GIS) sills, which are connected via the deep sill at the bottom of the Fram Strait. On the surface, this includes the Arctic Ocean and the Nordic Seas. The usual geographical alignment includes the Nordic Seas with the North Atlantic. However, for discussions of the THC, the use of the Arctic Mediterranean is relevant because ANY waters sinking into this deep basin must result in added flows over the GIS sills. As you showed in your 2006 paper, the GIS sill overflows settle to the deepest layers of the North Atlantic, but the deepest water is derived from the THC around the Antarctic associated with the yearly cycle of sea-ice. When the sea-ice forms, the freezing process rejects brine, which has a higher density than the surface waters and which sinks to the continental shelf. In the Arctic Mediterranean, some portion of the THC waters are the result of this same process and measurements have suggested that as much as 2 SV of sinking occurs at one location. So, I was curious about your recent paper and whether there was any discussion of changes in the THC poleward of the GIS shelf vs the data from the RAPID program line located at 26.5N. With the decline in minimum extent and volume of sea-ice, one might expect to see more THC sinking into the Arctic Ocean, with consequences for both climate and weather. LK, “Capitalism” is not the problem, or else the Soviet Union wouldn’t have wreaked so much environmental destruction, and the Communist Peoples’ Republic of China wouldn’t be the world’s largest emitter of CO2. Human irresponsibility and inability to think long-term is the problem. See http://tinyurl.com/oxnprd6 for discussion of Oleander data. Chuck Hughes 18, some ideas here, here and here. Leif Knutsen 35 “To stop climate change, flat CO2 emissions aren’t enough, say scientists” IMHO the movement of heat into the deep ocean with heat pipes as explained in the above references is also required and can produce as much zero emissions energy as we currently derive from fossil fuels. It also, possibly, would diminish the Greenland effect Stefan refers to because tropical heat moved to the deep water is unavailable to move towards either pole, where it causes melting. The thermal coefficient of expansion of sea water is also less virtually anywhere in the ocean than it is at the tropical surface. At 1000 meters it is about half. CT: He didn’t predict our immediate future. He said that in the distant past, when CO2 levels reached 1000 ppm, the thermohaline system something confused something something OMG WTF. I paraphrase. I don’t know what source he based that on. Are there good paleo proxies for other patterns of the thermohaline circulation? I wouldn’t recommend doing your thinking based on YouTube videos. Just sayin’, you can do better by reading. You might want to read some of the results from that search. SciShow is pretty good as an overview, but that’s speculative and oversimplified and for the sake of the message ignores vast amounts of time. I’ll leave it to others to fill in the blanks, but we all have trouble fitting our own lives into the context of geological space and time, and all of this, while happing pretty fast relative to geological time is not so fast in terms of your and my life. Hank at SciShow is simplifying to make his point, which is the dirty endgame of doing nothing is not pretty, but I don’t think it’s time to panic on that one. Just please get active and stick around. I’m far from an expert, but this is a good place to keep on asking questions. Like Sven @30 I would be interested to hear why the paper Rossby et al is not referred to nor discussed by Rahmstorf et al. In my own publications on SHBG and 5 alpha reductase if I had results that differed from those of others I spent time explaining why the differences might have occurred. Is this not common practice in Climate Science? In this instance, as the Rossby paper is based on direct rather than indirect measurements surely some discussion is warranted. In response to comment#30- Skeptics continue to mention Rossby et al (2014) as evidence that the Gulf Stream is not slowing down, which seems to contradict other observations of the Gulf Stream (http://onlinelibrary.wiley.com/doi/10.1002/jgrc.20091/full). However, a new paper just published in Global and Planetary Change (http://dx.doi.org/10.1016/j.gloplacha.2015.03.002) compares Rossby’s own data to other independent data and shows that 3 independent data sources consistently show similar trend in the AMOC and GS transport. The new paper also reconstructs an AMOC proxy derived from sea level data that could be compared with Rahmstorf’s SST-based proxy. Is this helpful in explaining how a warmer Arctic can change the pattern? The ocean conveyor gets its “start” in the Norwegian Sea, where warm water from the Gulf Stream heats the atmosphere in the cold northern latitudes. This loss of heat to the atmosphere makes the water cooler and denser, causing it to sink to the bottom of the ocean. As more warm water is transported north, the cooler water sinks and moves south to make room for the incoming warm water. This cold bottom water flows south of the equator all the way down to Antarctica. Eventually, the cold bottom waters returm to the surface through mixing and wind-driven upwelling, continuing the conveyor belt that encircles the globe. If that (very simple) explanation suffices — then with a much warmer Arctic, the Gulf Stream would not lose heat as effectively in that far North location? Can anyone draw a chart of where along its course heat is being effectively transferred and the resulting cooler water sinking? I’m wondering if the area where the Gulf Stream water can effectively lose heat and so sinks is altered — perhaps further South, where the air hasn’t warmed up as much? “Communist” China is part of the global capitalist system – indeed, a key part of it. Certainly other systems such as that of the USSR can be environmentally destructive, and certainly human short-termism is trans-cultural; but it is indeed capitalism that is driving the relentless push towards environmental destruction – and not only with regard to climate change. The key feature of capitalism is that the search for private profit largely determines where and how capital is employed; and it is this that pushes the fossil fuel industry to extract more coal, oil and gas as long as it is profitable to do so, to cut down forests for ranching and animal feed, and to buy up politicians and fund a successful campaign of lies about the consequences. The cooling could be due to mixing. At least in recent years, ARGO shows that mid-depth temperatures in the North Atlantic are rising, while surface temperatures are declining. Maybe the thermocline is weakening, as it is further North, and caused by Arctic warming. There is a second area where temperatures are consistently declining – in Antarctica, at the Southern end of the Atlantic. Data for this area are not available back to 1900, but at least since 1951 the cooling there has been greater than in the North Atlantic. It might not be a coincidence that the only cooling areas on the planet are at opposite ends of the Atlantic deep THC.